Whenever a plane goes down in the U.S., a "Go Team" made up of experts is assembled by the NTSB to investigate. Those people - each of them a leading expert in a specific area - are known as informally as "Crashers." When a passenger plane, a Vermeer One Eleven, slams into the ground outside Portland, Oregon, a team is quickly assembled to investigate the cause. Under the leadership of the IIC (Investigator in Charge), Leonard "Tommy" Tomzak, the team gets to work as fast as possible. But this time it's different. This time, the plane was brought down deliberately, without leaving a trace, and this was only a trial run. In LA, Daria Gibron - a former Shin Bet agent, now under the protection of the FBI- spots a group of suspicious-looking men. Missing her former life of action, she attaches herself to them only to learn that, somehow, they were responsble for the plane crash and are preparing for another action. While her FBI handler tries to find her and save her, Daria risks her life to try to get close enough to learn what's going on and thwart the coming terrorist action. But time is running out and her cover story is running thin. 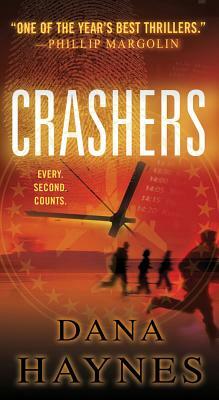 Dana Haynes' novel Crashers is a fresh and utterly compelling thriller, an original mix of action, investigation and a brilliant cast of characters that grabs the reader in the way few novels can and fewer do. Dana Haynes was, for more than twenty years, a journalist and editor at several newspapers in Oregon. He works for a local community college and lives in Portland, Oregon. He is the author of the thrillers Crashers and Breaking Point.